“In India, everything is exotic. 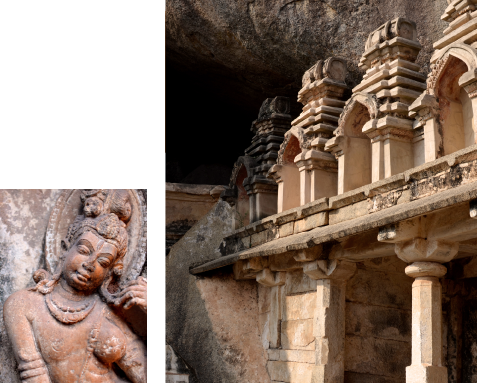 But I was promised even more exotica and history and culture with Hampi. Traditionally known as Vijaynagar, the name 'Hampi' is an anglicized version of the Kannada word 'Hampe'. Our journey to Hampi took place by the Golden Chariot train, a convenient way to travel around the area. I began in the small township of Hassan, where I spent my day visiting the temple sites of Halebid and Belur that were built in the 12th and 13th centuries by the celebrated patrons of art, the mighty Hoysala dynasty. They are Indian architecture at its finest. Lavish decoration with not even a hint of restraint. This compact sculptural style, exclusive to this dynasty, came to be known as Hoysala art. And as I looked around, I decided that the Hoysala artist was a perfectionist, whose chiselling was so fine, it resembled lace. I actually touched a bangle that rotated on a sculpted hand as stone bells rang. Halebid, was once referred to as Dwarasamudra, the gateway to the sea. Its fame began in 1127 and went on for more than 80 years. This temple was never completed but is still a masterpiece of Hoysala architecture. The star-shaped Chennakesava temple at Belur is the earliest temple built in commemoration of a military victory over the Chola rulers near Madras. It took more than a century to build and is still in daily use, a remarkable feat by itself. I then passed Hospet, another small South Indian town that forms the gateway to the magnificent World Heritage ruins of Hampi, formerly the great empire of Vijayanagar. Setting foot in Vijaynagar is a privilege as I stood in front of the world’s most spectacular ruined city. Its rulers patronized a variety of Hindu cults, while permitting the practice of other religions. The city thus became a rich cosmopolitan blend of people who led the city to excel in music, literature, sculpture and architecture, warfare, building, waterworks and agriculture. Historians like Nuniz and Paes called it greater than Rome with palaces plated in jeweled gold, the best provided city in the world. As I walk through Hampi, the ruins talk about markets that overflowed with the richness of silks, diamonds, rubies, emeralds, spices and cotton. They show me courtesans passing by in ornate palanquins. They share with me the despair of a proud, beautiful capital of the last Hindu empire that was systematically destroyed by the Moslem Deccan Sultans in 1556. Excavation at Vijayanagar was started in 1976 and is still continuing. All the ruins are by far, the most spectacular ones I have seen, but the Vittala temple with its delicately chiseled Lotus Mahal in the women’s enclosure, the Watch Tower, guarded once by eunuchs from where royal maidens observed festivities, the queen’s bath and the elephant stables, stands out. 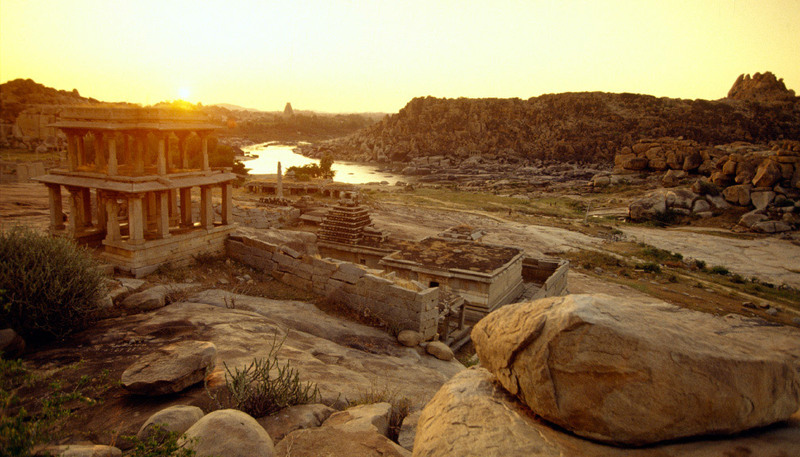 Hampi also occupies one of the most spectacular natural settings. Volcanic eruptions have shaped it into some sort of a mix of formations and ruins that have their own forlorn aura. The sunsets here are truly a picture-perfect moment. 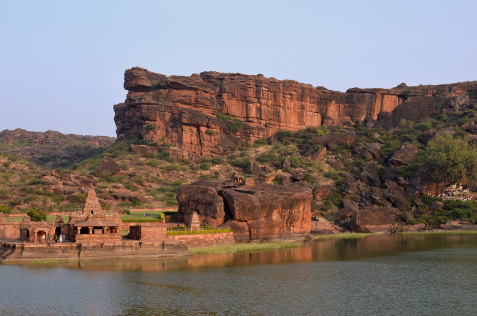 I take the train to Badami and spend the morning in Badami, Pattadakal and Aihole. Built by the Chalukya dynasty, the temples at Badami, Aihole and Pattadakal are amongst the most fascinating of India’s sacred monuments. Not only are they the largest group of stone buildings preserved from the sixth, seventh and eighth centuries anywhere in the subcontinent (there are over fifty temples still standing), but they are also an exhibition of many styles at once.